But the way to truly see the priorities of our state leaders is to look at the budget. This document, with pages and lists of agencies and numbers, shows exactly where the leaders who craft the budget are willing to spend and where they are willing to cut. And next year’s proposed budget reveals a lot about the new governor’s priorities. Next year, again, more money will be spent on private prisons. And next year, again, less money will be spent on education. In a stark demonstration of this contrast in priorities, this week both the House and Senate Appropriations Committees will hear presentations from two state agencies – the Department of Education and the Department of Corrections. One has seen funding for its constituents slashed year after year, the other has seen its funding steadily increase. Let’s take a look at that funding. Governor Ducey’s proposed budget calls for a $75 million cut to our state universities, a 50% reduction in funding for our largest community colleges and $13.5 million less to our district schools. Prisons, in contrast, see an increase of $52 million, including money to build more private prisons that will cost $100 million over three years. According to the FBI’s Uniform Crime Reporting Statistics, violent crime in Arizona has dropped by 40 percent since 1995 and property crime has dropped by 53 percent. But between 2000 and 2008 Arizona’s prison growth rate exceeded that of every other western state. The growth in prison population has come at a substantial cost. The Legislature has appropriated nearly $949 million in State General Fund monies to the Department of Corrections for fiscal year 2011. This represents 11.2 percent of the State General Fund budget and trails only K-12 education and healthcare appropriations. According to a 2009 department report, the State paid more per inmate in private prisons than for equivalent services in state facilities. After adjusting costs to make the expenditures comparable, the State paid private prisons $55.89 for each medium-custody inmate per day compared to a daily cost of $48.13 per medium-custody inmate in state facilities. The State also paid private prisons slightly more for each minimum-custody prisoner. Right now, our state has more people incarcerated than it has students at the University of Arizona. Article 11, Section 6 of the Arizona Constitution states that, “The university and all other state educational institutions shall be open to students of both sexes, and the instruction furnished shall be as nearly free as possible.” But more than a billion dollars in cuts over the past few years has forced the highest in-state tuition increases in the nation on Arizona families. It is certainly possible to begin reversing those cuts and lower tuition. That is, if higher education were a priority of those who control the budget. Another demonstration of this state’s misguided priorities is the lawsuit by legislative leaders to avoid funding K-12 education as mandated by the people of Arizona. That’s on top of the almost $4 billion in cumulative cuts to our schools since 2008. In 2000, the people of Arizona approved a ballot initiative that required the Legislature to adjust base funding for K-12 schools to avoid inflationary decreases. But beginning in 2011, the Legislature ignored the will of the voters and the rule of law by not including inflation funding in the budget. In September of last year the Arizona Supreme Court agreed with a lower court that ruled the Legislature must pay the funding, yet Republicans are still fighting the ruling and some even say they are willing to throw the state into a constitutional stand-off with the courts. All of this time and money spent to avoid putting money in our kids’ classrooms. That’s their priority. Handing even more hard-earned taxpayer dollars to private prisons. That’s their priority. But that’s not the priority of those who wrote in our state’s constitution that the Legislature, “shall provide for the establishment and maintenance of a general and uniform public school system,” though wrote nothing about providing for the profits of private prisons. 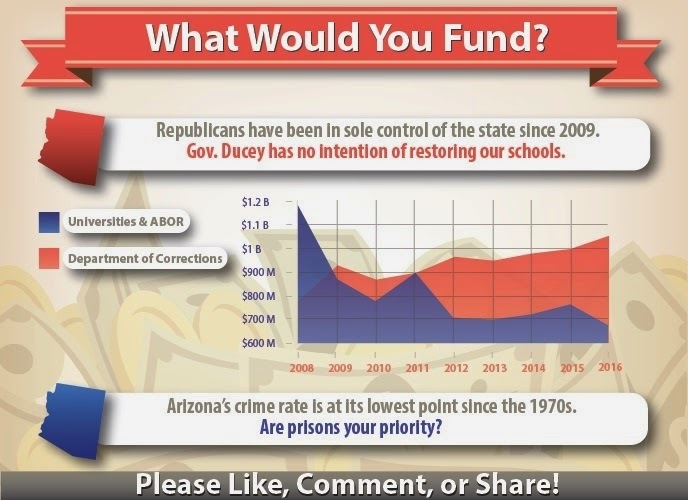 And that’s not the priority of Arizona families who would rather their children have a better chance to succeed through education and hard work than to wind up in prison. If you are unable to stop or slow down the unnecessary expansion of public and private prisons this year, please at least legislate to explicitly grant public access to the records of the private prison corporations operating in Arizona. For examples of explicit access to private prison information, look to Florida's Sunshine Law, Connecticut's Freedom of Information Act, and Tennessee's Open Records Act.